WebSentinel is a utility for monitoring the content of web pages for search terms at a scheduled time, optionally on a periodic basis. Drag and drop URLs or use the "Current Browser" button to add URLs to the list window. Then Click in the "Search Terms" column of each row to open an editor, and then type or copy the terms you want to search for in the content of the corresponding URL. Select one or more items and use the "Date-Time" chooser to schedule their search time. Use preferences to specify a repitition, such as repeat every 24 hours. 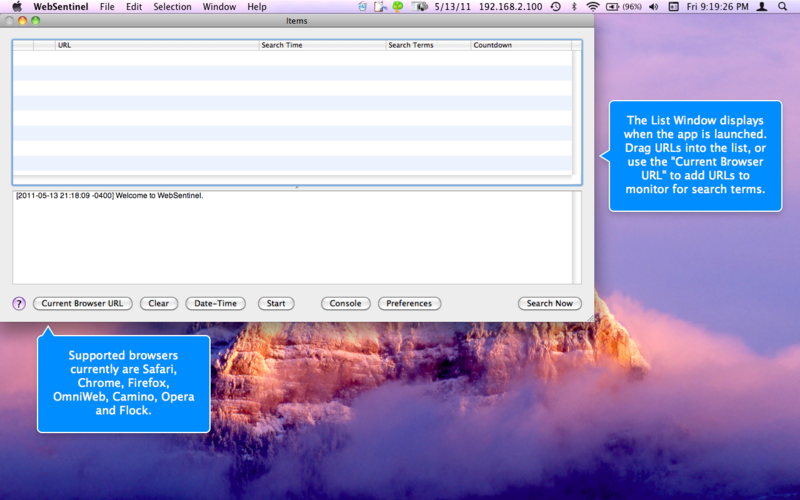 Various other options are available using the Preferences window. In particular enter your email address, and your mail server settings so that WebSentinel can email you to inform you of the search results. Click the "Start" button to run the schedule. WebSentinel also logs its results to its own console log file named "WebSentinel.log" in the WebSentinel folder in the Limit Point Software of Application Support.